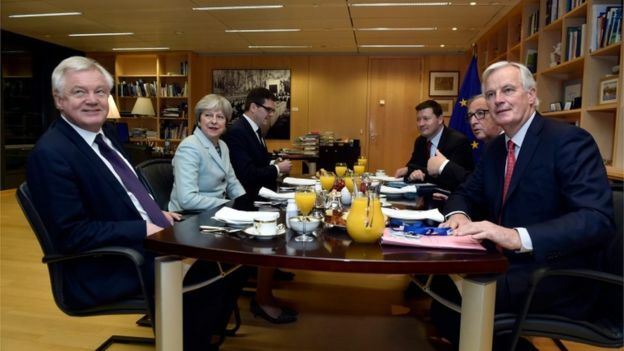 Theresa May agrees deal with European Union over Border with Ireland. British PM Theresa May has struck a last minute deal to move talks on to phase 2, trade. The deal states that there will be no hard border between Northern Ireland and the Republic of Ireland. European Commission President Jean-Claude Juncker said “the breakthrough we needed” had been achieved, after months of negotiations. Northern Ireland’s Democratic Unionist Party, whose opposition on Monday led to brexit being saved, said there was still “more work to be done” and how it votes on the final deal “will depend on its contents”. Mrs May depends on the party’s support to win key votes in Westminster. Negotiations had been “difficult for both the UK and the EU”, he added. Theresa May said getting to this point had “required give and take from both sides”. What concessions have been made? UKIP’s Cllr Tim Aker MEP said: “Today we find out that the European Court of Justice will be governing us for at least 10 years after we leave the EU. The national humiliation continues. Theresa May has bound us to paying the EU’s bloody money. “When the Government says there is no money to house the homeless, provide mental healthcare for returning service personnel and social care for the elderly, they somehow find £50 billion behind the sofa in Downing Street to hand over to Brussels. “The Tories will always put party before country and this deal is just about keeping May in Downing Street rather than making Britain great again.